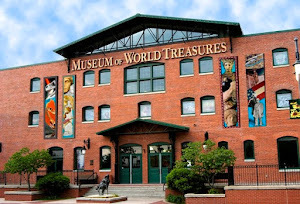 If you are familiar with the Museum of World Treasures, then you probably know about Ivan the Tyrannosaurus rex. After all, Ivan is the biggest artifact in the Museum, one of our main attractions, and a mascot for the Museum. What you may not know is why Ivan is called a Tyrannosaurus rex. Tyrannosaurus rex, or T. rex for short, is the most popular dinosaur. It is the only dinosaur to have a list detailing the location and completeness of every known skeleton. There are multiple books whose sole topic is T. rex and it almost always steals the show of every movie or cartoon it appears in. 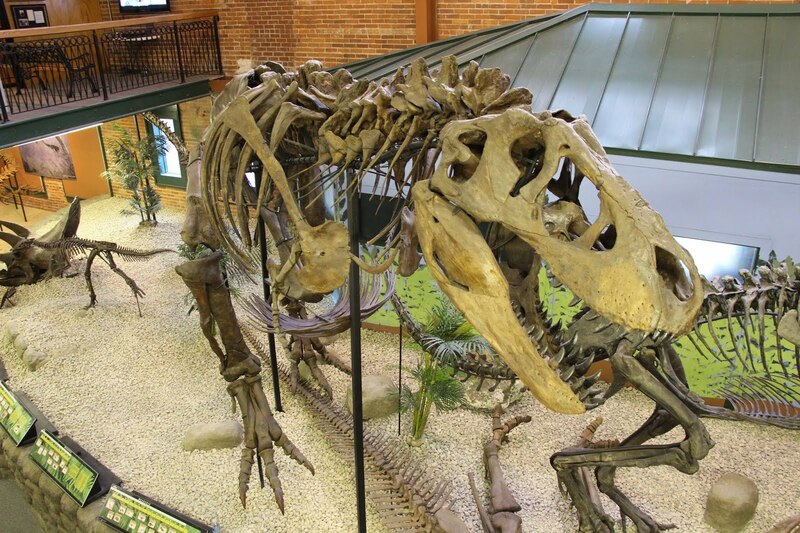 With all of this stardom, any museum would be proud to claim a T. rex as one of the objects in its collection. Despite its popularity, most people know T. rex as simply one of the biggest, meanest, scariest dinosaurs around. There are details most people know, such as its tiny arms with two fingers, a huge head with banana-sized teeth, and it can run on its hind legs, but these features do not define T. rex. As a matter of fact, all members of the family Tyrannosauridae have these features. Tyrannosaridae includes Tyrannosaurus and its closest relatives. Collectively, they are called tyrannosaurs. Other members of this group include Alioramus, Gorgosaurus, Albertosaurus, and Daspletosaurus. While most people are less familiar with these tyrannosaurs, the Museum of World Treasures is fortunate to have a Daspletosaurus displayed alongside Ivan. Visitors to the Museum can see two tyrannosaurs side-by-side and observe for themselves the similarities and differences between them. If a T. rex is not simply a big dinosaur with tiny arms and a huge head that runs around on two legs, how can we know if a dinosaur is a T. rex? That question may be trickier than you would think. For one thing, different paleontologists have different ideas about what makes a dinosaur a T. rex. Some paleontologists have said that they are sure Ivan is a Tyrannosaurus, they are just not sure that Ivan is a Tyrannosaurus rex. In case that difference seems trivial, Tyrannosaurus describes a genus while Tyrannosaurus rex describes a species. For instance, lions and tigers both belong to genus Panthera but a lion belongs to the species Panthera leo while a tiger belongs to the species Panthera tigris. To say that Ivan is definitely a Tyrannosaurus but may not be a Tyrannosaurus rex would be like saying that we are sure that Simba is a big cat but we are not sure that Simba is a lion. Maybe he is a tiger instead. Part of the reason there is confusion about whether Ivan is a T. rex is that there has been no publication formally describing and identifying Ivan. Instead, Ivan was just assumed to be a T. rex because he was found in the same place as other T. rex’s and because he is very large like a T. rex. In order to help clear up this confusion, Steven King, the Curator of Collections and Staff Paleontologist at the Museum of World Treasures, is currently doing a study to determine whether Ivan really is a T.rex. To conduct this study, he first searched the available literature to see how previous paleontologists have described T. rex. He then carefully examined Ivan’s skeleton and compared it to the published descriptions so see if there are any notable differences. In 2016, he plans to visit the site where Ivan was dug up in order to understand what layer of rock Ivan was found in. He will also visit a few museums that have tyrannosaurids and examine their skeletons. It appears that Ivan is indeed a T. rex, since there are no significant differences between Ivan and published descriptions of T. rex. This information indicates that Ivan is a T. rex. However, things do not end there. Scientists are a picky bunch and one thing they are very particular about is that other scientists get a chance to critique what a scientist says. In order to have his ideas critiqued, Steven will have to write and submit a paper to a scientific journal. After their panel reviews and critiques the article, it may be published. If it is published, the information can be spread to other scientists who can continue to review and critique the information. Until that time when the information about Ivan is shared with other paleontologists, the staff at the Museum of World Treasures are confident that Ivan, our beloved star and mascot, is in fact a Tyrannosaurus rex. Come to the Museum and check out Ivan for yourself. Maybe you will be inspired to ask questions and learn more about dinosaurs like him. For more information about Ivan and other artifacts on display at the Museum please visit our website or call 316.263.1311 to schedule a tour.